The expressive qualities of spoken word, sound and music enrich our lives and who better than Radio and Sound Art to showcase this. 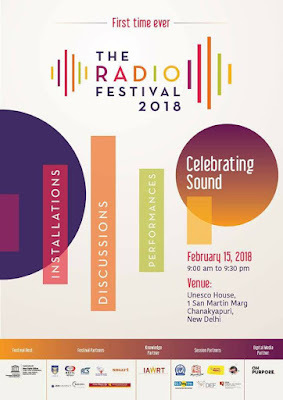 The Radio Festival (TRF) is all about that, being celebrated on 15 February , 2018, at UNESCO House, 1 San Matin Marg, Chanakyapuri, New Delhi. Conceived and initiated by the International Association of Women in Radio and Television IAWRT, a network of women associated with all media- print, television, radio and film, TRF will bring together Public, Private and Community radio and audio works on a single platform, in time to celebrate World Radio Day that falls on February 13 every year. The festival is an effort to break the silos between different broadcasting tiers and create an opportunity for engaging and learning from each other. What makes TRF unique is its inclusivity of all forms of radio and audio offerings, to tell their stories and share experiences on a variety of themes like Sports -which is the World Radio day theme of 2018- Creativity in Programming; Driving social change through storytelling, Technological innovations in broadcasting and media convergence, and Understanding Wide Ranging Audiences, cutting across age, geography, literacy and language barriers. On board are multiple stakeholders from the Industry, NGO Sector, Private FM Radio Players, All India Radio and Community Radio Stations. Decision makers from the Ministry of Information and Broadcasting are expected to participate in the festival. For the first time ever in the country, The Radio Festival , will bring together Public, Private and Community radio and Audio works on a single platform, in time to celebrate World Radio Day that falls on February 13 every year. What makes TRF unique, is its inclusivity of all forms of Radio and audio offerings, to tell their stories and share experiences on a variety of themes like sports (which is the World Radio day theme of 2018); understanding the social environment and providing information, education and entertainment through sound to wide ranging audiences, cutting across age, geography, literacy and language barriers. The event is open to public without any delegate fee.